with external LED -Dual Size full angle LED. Advanced 32 bit ARM CortexM4 high performance processer, can operate NuttX RTOX real time operation system. Intergrated back up power and lose efficacy controller, main controller lose efficacy can safely alter to back up control. Providing automatic and manual mode. Providing redundant power supply input and failover. Providing multi sound buzzer interface. Micro SD records flying data. 32 bit 2M flash memory STM32F427 Cortex M4, with hardware floating point processing unit. 32 bit STM32F103 back up processor. L3GD20 3 axis digital 16 bit gyroscope. LSM303D 3 axis 14 acceleration/magnetometer. 5 UART, one compatible high voltage, two have hardware flow control. Spektrum DSM/ DSM2/ DSM-X satellite receiver compatible input. Futaba SBUS compatible input and output. 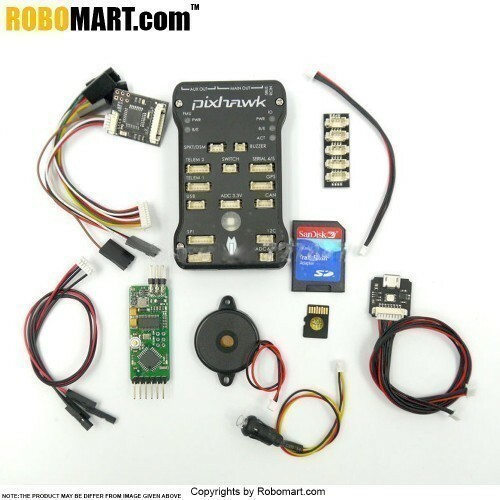 Pixhawk px4 2.4.6 32 bit ARM Flight Controller X 1pcs( with origianl DF13 connector ). 4G SD Card X 1pcs(we have updated it to 8GB SD Card for free instand of the 4GB SD Card Friend, when you pay it, we will send you the 8GB SD Card). SD Card Adapter X 1. Pixhawk-I2C Splitter Expand Module X 1pcs. External LED light board X 1pcs.